A meticulously penned historical mystery, Shall We Not Revenge weaves complex characters into an intriguing plot. The sophomore novel from D. M. Pirrone is a gripping mystery that troubles the very notions of innocence and guilt. 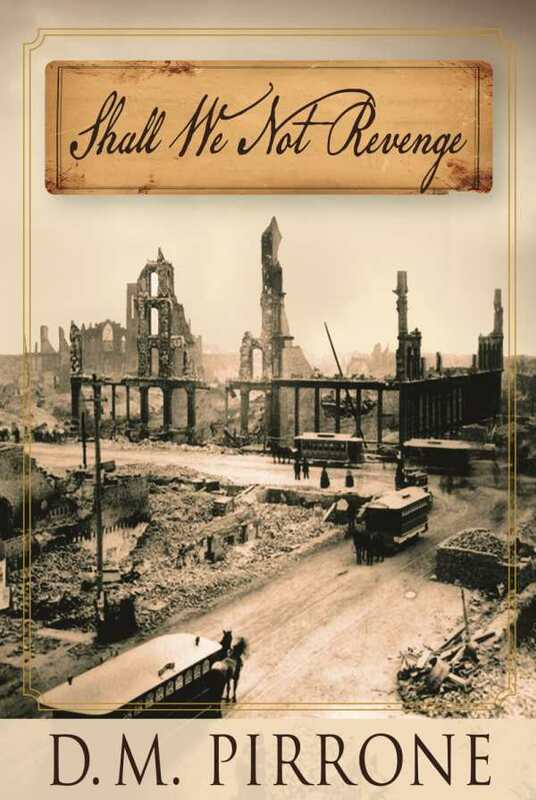 Shall We Not Revenge is an eminently consumable and intelligent read. The novel opens on the worst day of future detective Frank Hanley’s life. The savage murder of his beloved at the hands of shady, underestimated coworkers sets his future on a new course. Driven by a fresh sense of righteousness, beneath which runs some desire for revenge, Hanley rededicates himself to the pursuit of justice. A little over a decade later, his police work leads him to a synagogue where a respected rabbi has just been brutally murdered. The rabbi’s intriguing daughter, Rivka, inserts herself into his investigation, pressing for swift resolution despite her community’s protestations. Together Hanley and Rivka uncover a web of technical crime, woven between public aide organizations assisting those displaced by the Chicago fire and mob syndicates, of which the rabbi was loosely a part. Hanley must navigate old tensions, grapple with entrenched enemies, and work his way through the various communities of Chicago to deliver Rivka the resolution she desires, though paragons and power figures may topple along the way. Pirrone is deft at bringing her characters to life, drawing each with a nod to the complexities around which personalities grow. Not even the protagonists of her novel are perfect: the murdered rabbi is found to have questionable connections, Hanley maintains a desire to cause pain to those who have wronged him, police chiefs are corruptible, and aide organizations divert donations to the mob. The flaws in the best amongst her characters make them seem all the more real, and readers will be caught in tides of sympathy. Questions of right and wrong propel the mystery toward its conclusion, with intriguing results. Pirrone recreates a roiling time period in Chicago with skill, paying homage to the cultures of those at its margins. Both Irish and Jewish communities have an authentic feel, without the characteristics of either being overdrawn. Just enough Hebrew is woven in, with just enough evocation of the old country included. Even Pirrone’s character descriptions have a fresh quality, with one pieced together from a “dewlapped neck” and a splotch of a mouth. In such ways, Pirrone’s pages evince strong authorial discernment, and her care makes the novel’s last pages all the more satisfying.